Whenever I am indoors, I seek sightlines to outdoors. When I am outdoors, I am often intrigued by objects that frame my view, and by outside scenes created when it appears I am looking inside. A window has a frame. A window is a frame. Are you inside looking out, or outside looking in? Is there a difference? Where do your daydreams lead? A shop window is at its best when selling dreams that might be provided inside: inviting you to share the vision. 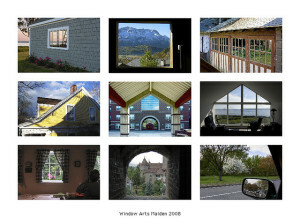 Here, during Window Arts Malden, you see a window, as a frame, with a window frame inside, which, in turn, frames other windows. I hope my windowscapes will allow you to imagine yourself somewhere other than where you are. A real place. That you could reach. If you could only get through the frame. Let your mind take you there.